Can countries be both economically efficient and have equal societies? Conventional wisdom suggests that this is not the case. Jonathan Hopkin, Victor Lapuente and Lovisa Moller take a close look at the empirical evidence. They find that the less unequal a country is, the more likely it is to be innovative. They argue that while the US combines high levels of inequality and innovation, other countries with much lower inequality levels are also high performers in innovation. The idea of a trade-off between economic efficiency and equality has long animated debates in political economy. With most of the advanced economies seeing increasing inequality, and sometimes spectacular growth at the top despite the stagnation of median incomes, this trade-off may seem, at first sight, as acutely present as ever. The dominant view amongst political scientists is that the more egalitarian type of capitalism found particularly in Northern Europe is just as efficient as the more market-oriented system characteristic of the Anglo-Saxon countries. But a recent paper by Acemoglu, Robinson and Verdier (ARV) argues that although some countries can opt for a ‘cuddly’ form of egalitarian capitalism without sacrificing economic efficiency, we cannot all buck the trade-off at the same time. ARV argue that redistribution and equality hinder innovation, and therefore some countries have to adopt a more ‘cut-throat’ form of capitalism if the world’s technological frontier is to be pushed backed to everyone’s benefit. In other words, it is possible to combine efficiency and equality, but only by ‘free-riding’ on the innovation produced by the more ‘cut-throat’ capitalist economies. They develop a formal model for their theory, but do not provide any empirical evidence of innovative differences beyond a patent filing comparison between the United States and Scandinavia. Taking their work as a starting point, we have looked at the claim that inequality is a necessary condition of innovation. 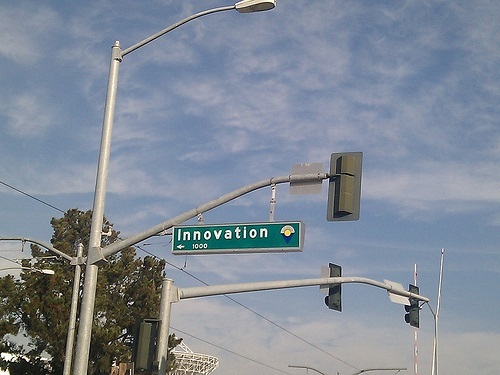 Certainly, the US has a unique position in technological change, with much of its advantage in patent filing being down to the location of the advanced ICT research community in California. 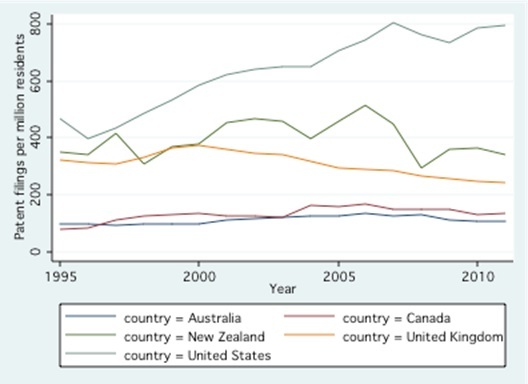 ARV’s key empirical data is the stylized fact that the United States –the most unequal of the advanced economies – has outperformed the Scandinavian countries in patent filings in the last two decades. However, if we expand the period of study with a few more decades, Sweden has had more patent filings per resident than the US for most of the last half-century. Further, the other Anglo-Saxon countries are nowhere near the United States’ patent filings levels, as shown in Figure One below. A broader look at patent data hence casts some first doubt on the hypothesis that cut-throat incentives are needed for innovation. Note: Patent filings in the United States compared with patent filings in other Anglo-Saxon countries. Source: The authors’ own calculation based on patent application and population data from the World Bank (database: World Development Indicators, indicators: IP.PAT.RESD and SP.POP.TOTL). The explosion of patents filed in the recent period, on which ARV’s intuition seems to rest, is not the only measure of innovation. Indeed, the phenomenon of ‘patent trolling’ – whereby patents are used as a means of generating returns by threatening legal actions, rather than a source of productive innovation – suggests it may be measuring rent-seeking strategies as well as genuine inventions. We also looked at the Global Innovation Index for 2013, which ranks countries in terms of both innovation outputs and the favourability of the institutional environment to innovative activity. 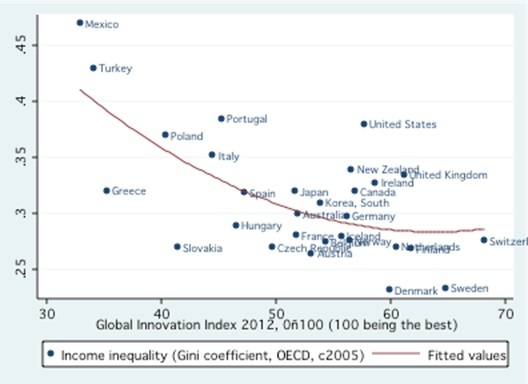 Figure Two shows a scatterplot of OECD countries which shows the relationship between innovation measured by the GII, and disposable income inequality. The results suggest that the less unequal a country is, the more likely it is to be innovative, and the United States loses its leading position, falling behind a number of OECD countries with lower, and sometimes much lower, inequality. To look further at the link between inequality and innovation we also ran ordinary least squares regressions with the GII score as the dependent variable, and inequality (measured both as the GINI coefficient and the 50/90 wage ratio, to capture the incentive effects of higher top incomes) and top tax rates as the main independent variables. We controlled for country income (GDP per capita), research and development spending, and the regulatory environment. ARV’s model assumes that inequality and lower taxes on top incomes should be positively associated with innovation. Our results instead confirm that if anything, the opposite is the case: lower inequality predicts higher levels of innovation, although the positive link between higher tax rates and innovation is not robust to the introduction of the control variables. What can we conclude from this preliminary examination of the evidence? It is true that the US is a powerful force for innovation in the world economy, and is a good example of ‘cut-throat capitalism’, with high levels of income inequality, and very high top incomes. But other countries with much lower inequality, generous welfare states and a smaller concentration of rewards at the top are also high performers in innovation, whilst some countries with high inequality perform poorly. High regulatory quality and R&D expenditure are common denominators for countries that are ranked as highly innovative – inequality is not one of these uniting factors. Innovation is not just about a narrow view of incentives based on spectacular rewards for a small number of high achievers; it also rests on high levels of investment in research, not just by the private sector but also, and often decisively, by the state. The US combines high inequality with excellent universities financed by both public and private funds, and a regulatory environment that encourages innovation. ‘Cuddly capitalist’ countries that invest in research, have good universities and quality regulation can also innovate, without having to offer successful entrepreneurs outsized rewards. There seems little evidence for the thesis that egalitarian societies need to freeload off the innovations of the American super-rich in order to prosper. This article was originally published on LSE’s USApp blog. Jonathan Hopkin is an Associate Professor in the Department of Government at the London School of Economics and Political Science (LSE). He is mainly interested in political parties, elections, redistribution and inequality. His work has appeared in a range of journals including the British Journal of Politics and International Relations, European Journal of Political Research, the Review of International Political Economy, and West European Politics. Victor Lapuente is a Senior Lecturer and Associate Professor at the Department of Political Science and a Research Fellow at the Quality of Government Institute (QoG Institute), University of Gothenburg. His research deals mostly with comparative public administration and corruption. Lovisa Möller is a graduate student in Global Politics at the London School of Economics and Political Science. She has previously worked with quantitative analysis at the Quality of Government Institute, University of Gothenburg, and as a researcher at Factwise. Sure, inventors and innovators need support but that support need not come from concentrations of wealth. Indeed, the phenomenon of concentrating wealth into government or university or venture capitalist could be skipped altogether. How? Just pay citizens a dividend from society’s spending for things not created by labor or capital, things like land, natural resources, corporate charters, and patents and copyrights. Those government-granted privileges and natural assets capture a torrential flow within the GDP. You could redirect that flow, using fees, dues, taxes, etc, into public treasuries then back out again as dividends, a la Alaska’s oil share. Further, you could shift taxes off labor and capital, onto pollution and depletion. That way, you’d redirect investment from industries like oil and into cutting-edge technology. Thus you could enjoy progress, economic parity, and do so without any paternalism from the state. More at progress.org.